Join six Chambers of Commerce to meet new Chamber friends and business relationships at our fall B2B Expo and luncheon. 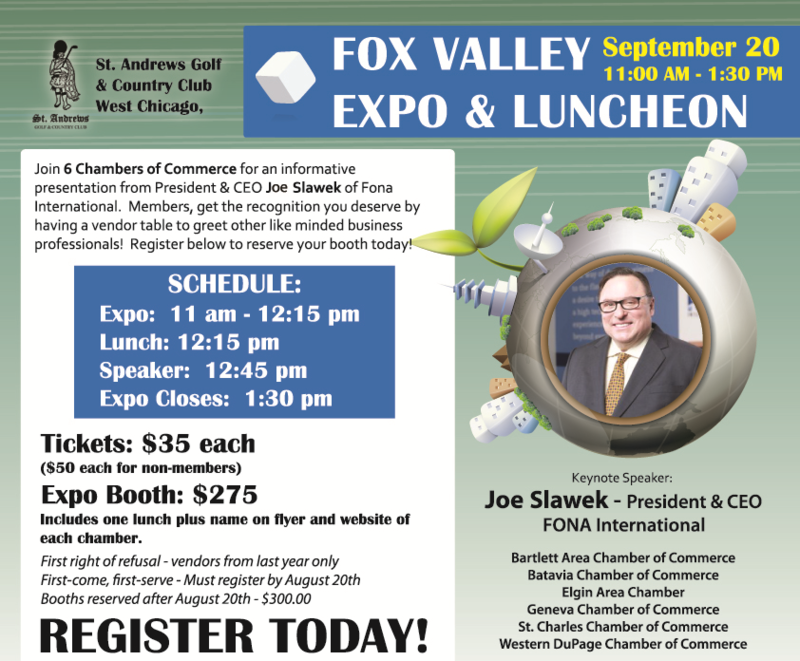 Held at St. Andrews Golf & Country Club in West Chicago, this is your opportunity to network and meet Chamber members from through the Fox Valley area. We're featuring guest speaker President & CEO Joe Slawek of Fona International. Join us to learn from Joe's success in leadership, workforce development and business growth. After years in the flavor industry, Joe Slawek saw the need for a different kind of flavor company that had both great technology and great service. We call it “high tech, high touch.” Joe wanted to build an organization that could compete with the largest flavor companies across a range of market segments, but also connect with customers as only small companies can, developing relationships, sharing visions, methods and time. He founded FONA in 1987 on these principles. It’s this commitment to customers that makes FONA a special organization. In addition to FONA’s awards and recognition (including Great Place to Work and Fortune magazine), Joe has been personally honored with the Ernst & Young Entrepreneur of The Year award for Manufacturing in the Midwest. Expo booth - $300 includes one lunch, name on flyer & website of 6 Chambers. Early Bird booth discount until August 20 saves you $25!